This is the first, fast and furious Bangladeshi business blog where we talk about Bangladeshi brands and businesses from a consumer experience perspective. We appreciate their good actions, criticize their false promises, expose their internal malpractices, evaluate their accomplishments, business strategies and propose ideas for better branding, better business and protection of our (consumer) rights in the process. Interested to place an advertisement for your business? As a shorts-donning young boy, I used to ask my lungi-donning abba, "If we ever go wearing this to Sonargaon hotel, will they let us in?". Abba used to casually and confidently reply, "If we go wearing a lungi, they might put us in a special cell and never let us in there. But with shorts, you might get in". Same with cars and baby-taxis (CNGs!) I guess. I always used to think that if I ever end up at Hotel Sonargaon by a baby-taxi, the gatekeepers of the then posh hotel would not give me as warm a welcome as I would get if I would have got off a car. One day our pilot Shafiq (our chauffeur) was asked to carry out the week's grocery shopping from Nandan. As a preparation, he then decided to shed his lungi and put on trousers instead, he also insisted that he be allowed to take the car along with him. Upon asking why this ornamental preparation for merely doing a grocery shopping at Nandan, he replied "Bhaiya oigula borolok er jayga, lungi poira ar haita gele dhukte dibo na" (Bro those are places where the well-off shop, they won't let me in if I walk in and that in a lungi'). Funny how even big retail malls such as Nandan might have a perception of being as posh and exclusive as five star hotels, barring entry to those who don't comply with unwritten dress codes or vehicle status quo (no car no entry...wearing lungi no entry). I wish how nice it would be if Nandan or Agora could come up with their branded mini-buses to ferry customers from different locations of the city (or even from outskirts) straight at the doorstep of their respective retail fortresses. If they are wary of the fact that there are too many free-ride lovers in Dhaka city who might take them for a ride by travelling in the vehicle to go to other destinations or disappearing from the entrances, then they can atleast provide free transport (as free love from the brand) to those customers who have just finished shopping and are waiting frustratingly on the streets to convince a CNG or a stubborn yellow cabbie to take them back to their destinations loaded with a whole range of shopping bags. So say for example a bus could run from the Rifle's Square branch of Agora every 30 minutes to cover areas such as Dhanmondi and Mirpur and selected points en route. Similarly another bus can cover the Gulshan branch and areas such as Uttara or even Gazipur. Shoppers who have made a purchase of a minimum amount (say 100 Taka) míght qualify to get on the buses by showing their proof of purchase. I think the feeling that the brand cares for the customer even after they are done with the shopping is of great importance. Customers without any private vehicles can shop happily and heavily without the anxiety of how to get back home through the horrifying traffic jams of Dhaka city, worse even if the weather is bad too. As their favorite retail shop has air-conditioned mini-buses stand by every half an hour to ferry them for free. Ikea, the giant world famous retailer of house-hold products provides similar service all around the world to its customers for free and this act of free love from the brand is well appreciated by its customers. As we see branded mini-buses from leading telcos in the city ferrying their employees, we stare and try to see the faces through the tinted glasses of the priveleged employees and wonder how nice it must be to work in those companies. Similarly we will stare at Nandan or Agora branded mini-buses filled with happy customers and keep wondering how nice it must be to shop at those places. Even if the retail shops take you for a ride in terms of product prices, atleast they would offer you a free ride back home with all the shopping. Also, from outside, no one can figure out if the customers had a private car or not, or wearing a lungi or trouser. Provided they let us in in the first place in a lungi, rest can be a happy experience till the end. The idea is good but I am confused about the feasibility of the matter. Because environment of IKEA is not as the same of Nandan or Agora. Don't bother, I though appreciate you for introducing us with such good ideas. One day Dhaka city will be jam free and we will see shoppers' carrying buses moving at a high speed to perfectly maintain the schedule.... Whats wrong to have a positive dream? NB. could you please guide me how to post writings in blogspot? dear anon...initially you need to email your articles to bangladeshcorporate@gmail.com, later you will be allowed to publish without any moderation, intervention. Looking forward to your contribution. Hmm, euphobic idea!!!??? Sometime ago, I wrote comments for another write up ( copying mass discounting idea of AIR ASIA) that just copying and pasting an idea from one sector to another sector could be dangerous without understanding cost model/business model/revenue structure/customer segement/strategic segment. The revenue model/margin model/strategic segment( this is not same as customer segement) of IKEA is quite different from general retailing. The writer might have done a better job if he thought deeply about why Wal-Mart, Carrefour, Metro are not copying the model of IKEA and then recommend the copying of the IKEA free shuttle by Nanda/Agora of Bangladesh. Suggesting that oh cos A is doing B in country C in Sector D , why don't cos. X do B in country Y in sector Z does not make sense. This is kind of those logical fallacy we used to study for so called American standardized tests such as SAT. In Business world those stuffs dont work. And Bappi is quite right. We need to expand the city, encourage people to relocate in satellite towns, relocate industries from Dhaka and nearby areas,and above all we need Mass Rapid Transport system. A heavily populated city such as Dhaka cannot survive if it does not have at least 25% of its space for transportation. I am sure Dhaka has got far less space. @Bappi , u are right but irrelevant.90% of today's city can be solved by urban planning.it just a mega store strategy suggestion. the thing is in a very busy day, u wont see 5 cng taxi outside Nandan. that's because these people are coming from 5- 10 min distance.even with the bus service, the would have to take rickshaw to get to there doorstep. so why bother with bagful of grocery.and i am sure there is a department store within 10 minutes way from uyour home, whatever the brand it is. great dialogue. The introduction of the free bus service is not a panacea to all the problem's of Dhaka city. The scope is limited to a retailer trying to do something innovative, spotting an existing vaccum in the sub-standard public service system in Dhaka and provide a localized solution. @skywalker: I would say that the Ikea connection is very valid here. Ikea has a problem in that its products are very bulky (=flat-packed furniture) and you can't transport them on public transport. Hence, Ikea is not a feasible option for those potential consumers who don't have a car of their own. (And in Europe, this covers lots of people with purchasing-power. )The bus makes it possible to buy Ikea stuff and take it home even without a car. 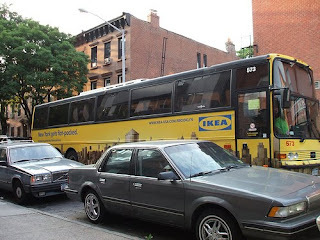 If we consider grocery shopping to be a similarly bulky purchase, and the traffic jam situation similar to the lack of a car (= such bad traffic that there is no point using the car), then the free minibus service from Agora works just as well as the free bus from Ikea. Incidentally, I think the author identified one reason for the unspeakable Dhaka traffic at the beginning of his post, with the story of the driver who insisted on arriving in a car. Those who can afford cars are under enormous pressure to always use those cars - for status reasons - even when it makes zero sense from a transport point of view. So people prefer to be driven 300 meters, taking 20 minutes and exacerbating the jams, because if you choose to walk and take 2 minutes you would not be immediately recognised as a high-class car owner when you arrive. People spend an hour going a kilometer in a car- folks, this is a ten-minute walk, 15 for a leisurely stroll that doesn't raise any sweat. I guess it shows that status symbols are more valuable than time or nerves or blood pressure. @Finn in Dhaka...thanks for your comments. Do you blog on business?? Why not make public transport fare-free for all of Dhaka, and solve a million problems at once. If implemented intelligently, it can work. There are many examples. Just google free public transit. Excellent,this was very interesting blog. First of all i am kind of a regular reader of BCB from the very first day I heard about it in our french class. Bangladesh Corporate Blog was a really new concept at the time of its origin, because there wasn't any blog or newspaper which directly focuses on the corporate world except the daily newspapers which only shows the foreign exchange rates and share info. and claims itself to represent the economical situation of the country. The blog has helped me to learn a lot about the ongoing economic crisis and the role of the corporate giants in our country,their good and bad effects besides it has played the role of a good critic against the financial steps taken by the government, no doubt this blog is good tool to start with for the upcoming entrepreneurs who are thinking to start something in Bangladesh. Part time and voluntary jobs in Bangladesh: Can bdjobs.com help? In no event will we be liable for any loss or damage including without limitation, indirect or consequential loss or damage, or any loss or damage whatsoever arising from loss of data or profits arising out of, or in connection with, the use of this blog. Through this blog you are able to link to other blog and websites which are not under the control of Bangladesh Corporate Blog. We have no control over the nature, content and availability of those blogs and sites. The inclusion of any links does not necessarily imply a recommendation or endorse the views expressed within them. Every effort is made to keep the blog up and running smoothly. However, Bangladesh Corporate Blog takes no responsibility for, and will not be liable for, the blog being temporarily unavailable due to technical issues beyond our control. ______________________________ These posts in Bangladesh Corporate Blog are licensed under a Creative Commons Attribution-No Derivative Works 3.0 License. Permissions beyond the scope of this license may be available at bangladeshcorporate@gmail.com.